This is the name given to a brimless, limp, conical cap fitting snugly around the head. It is supposed to have been worn by the inhabitants of Phrygia, a region of central Anatolia in antiquity. The book Iconologia by Cesare Ripa (first edition 1593) and other works from the sixteenth and seventeenth centuries describe and depict the cap. As these works state, the Phrygian cap was worn by liberated slaves in ancient Rome and Greece. It was also worn on special occasions afterwards. In fact the cap played a minor role in the slave manumission ceremony. Its link with Phrygia in Minor Asia is also tenuous. The idea seems to have been that Phrygia was a source of slaves who when freed - if freed - would once again don their traditional headgear. Whatever the truth, the Phrygian cap was picked up and used as a symbol of liberty by libertarians during the Enlightenment. The "Phrygian cap" (in French, bonnet Phrygian) is almost invariably depicted in red and is sometimes called red cap (bonnet rouge) or liberty cap (bonnet de la Liberté). It was used by a series of revolutionaries - who seem to have picked up the symbol one from another. There is some doubt as to whether the French Revolutionaries got it from the American Revolutionaries, or whether the American Revolutionaries had got it from pre-revolutionary French ideologues. Since the American Revolution came a few years before the French, American iconography can be used as a sort of introduction. The liberty cap is one of the gererally recognised symbols of sovereignty not mentioned in article 2 of the French Constitution of 1958, which refers only to le drapeau tricolore, bleu, blanc, rouge: The French Flag , L'hymne national, the national anthem, The Marseillaise and La devise de la République; the motto . "Liberté, Égalité, Fraternité". The Liberty Cap in North America. In the American colonies the Liberty Cap had been was used, perhaps a little melodramatically, by the Sons of Liberty in 1765. 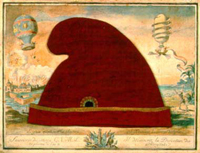 During the American Revolution some soldiers who fought for the rebel cause wore knitted stocking liberty caps of red. Sometimes they had the motto "Liberty" or "Liberty or Death" knitted into the band. This style of cap was common in the North East (possibly reflecting French influence). "Jonathan" (the allegorical figure of colonial New England) is sometimes shown wearing a liberty cap. Liberty caps were sometimes held aloft on a Liberty Pole during the American Revolutionary War as a symbol of freedom. It is not clear whether the idea of using these caps was imported from France. The liberty cap, or something like it, was already associated with revolt against established authority in France. The Revolt of the Red Caps for example was a series of riots in Brittany in 1675 triggered by Colbert's taxes. The coin (of 1850) on the left shows Liberty holding a Liberty Pole with a Phrygian hat on it. On the right is the Liberty Seal of the US Senate with a Liberty cap surmounting the arms in the centre and crossed fasces underneath. A Liberty cap - oddly a golden one - features in the arms of New York, the original national capital of the USA. The dexter supporter to the arms is blazoned as follows: "The figure of Liberty proper, her hair disheveled and decorated with pearls, vested azure, sandaled gules, about the waist a cincture or, fringed gules, a mantle of the last depending from the shoulders behind to the feet, in the dexter hand a staff ensigned with a Phrygian cap or, the sinister arm embowed, the hand supporting the shield at the dexter chief point, a royal crown by her sinister foot dejected." (In the language of heraldry the word "or" means gold). A Liberty Cap appears on the State flags of West Virginia and New Jersey as well as the official seals of the United States Army and the United States Senate. A Liberty Cap also features on the seal of Dickinson College, in Carlisle, Pennsylvania, the first college to be chartered in the new Republic of the USA. The figure on the left is a detail from the US Senate's painting Telegraph by Constantine Brumidi showing a female personification of "America" wearing a Liberty Cap. Although the Liberty cap - or cap of Liberty - is so common in US revolutionary iconography, it is curious that it is rarely shown being worn. It is shown either as an isolated symbol, or on top of a Liberty pole or similar support. The one on the near right is coloured like an American flag and held on a pole. The design on the far right features another Liberty cap also on a pole along with a fasces. This design was taken from an envelope dating from the American Civil War. Plans for the new dome of the national Capitol, which was authorized in 1855 included an allegorical figure of Liberty (called "Freedom triumphant in War and Peace") wearing a Liberty cap. Jefferson Davis (then Secretary of War) objected to the Liberty cap so the architect replaced it with a rather eccentric Roman helmet (See Liberty). The Liberty Cap in France. The Phrygian cap (in French, bonnet Phrygian) is also known in French as the Liberty cap (bonnet de la Liberté) or as a red cap (bonnet rouge). It was adopted during the French Revolution. Liberty is sometimes shown wearing a Phrygian cap. So is Marianne. 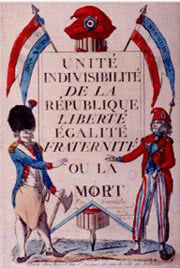 Representations of soldiers in the French revolutionary army show them wearing liberty caps as part of their uniforms - as in the picture on the right. In revolutionary France the use of the Liberty cap is documented from 1789, but the cap became a popular symbol only in the spring of 1790. It was initially worn by goddesses Liberty and Nation (the latter later morphing into Marianne). In 1792, it became part of the uniform of the sans-culottes. On 20 June 1792, King Louis XVI was obliged to don a liberty cap by a crowd that had stormed the palace of Tuileries. When the Archbishop of Paris was forced to resign his duties he was made to replace his mitre with the red Cap of Liberty. After the fall of the French monarchy, the Liberty cap became more common. It coiffed representations of Liberté, sometimes sitting, sometimes standing. It also appeared on top of pikes and flag poles, Liberty trees, Fasces of Unity, Triangles of Equity and atop the scales of Justice. On the left a Liberty cap is shown being worn by a soldier, and another one hides the ax head of the fasces just visible behind the banner. By 1793, members of the Assemblies of Paris were obliged to wear a Liberty cap. The Convention accepted it as a national symbol and had it placed on the French Seal of State of the Republic and also on milestones (to replace the royal fleur-de-lis). The cap was clearly regarded as an importannt icon - on the right is a portrait of one. It seems always to have been associated with the more extreme revolutionaries and so has always faded into the background during periods of stability when French governments are keen to discourage new revolutionary ideas. Under the Consulate, the capped Liberty was replaced by a less revolutionary helmeted Minerva. Liberty caps were removed from all public monuments. Napoleon is reported to have detested the Phrygian cap. The picture on the left is called La Liberté guidant le peuple (Liberty Guiding the People). 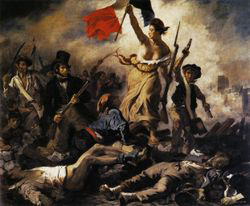 It is by Eugene Delacroix and hangs in the Louvre in Paris. In it, Liberty is brandishing a French tricolore flag and wearing a red Phrygian cap - which you can just about make out in the detail on the right. The painting was inspired by the insurrection of July 1830 in Paris during which the last king of France (Charles X) was forced to abdicate and was replaced by the 'King of the French' Louis-Philippe. Apparently there is some subtlety in the different titles that must have carried significance at the time. During the Second Republic, insurrectionists forced the provisory government to add a liberty cap on the white stripe of the French tricolore flag around February 1848. The cap then disappeared again - not only from the flag but also from the French Seal of State of the Second Republic. It was reestablished as national symbol during the Third Republic. The liberty cap is still worn by Marianne, the feminine representation of the French Republic; but only sometimes. Her bust, which adorns city halls of France, sometimes sports a rather less revolutionary tiara. She wears a very discreet Liberty cap on the new French logo shown above. Other Countries. Elsewhere, the cap was incorporated into the symbol of the late 18th century Irish revolutionary movement known as the Society of the United Irishmen. It also carried over to Latin American revolutions of the 1820s. The cap appeared on Mexican coins through the late 19th century into the mid 20th century (including the old 8 Reales coin). Today, it is featured of the coats of arms, national flags or seals of Nicaragua, El Salvador, Colombia, Paraguay and Cuba. In Argentina it appears not only on the national arms and flag, but also those of the army and navy, on presidential flags and the flags of provinces including Corrientes, Jujuy, Mendoza and San Juan. As in the US, the cap invariably seems to feature on top of a stick, rather than people's heads. Before the Phrygian cap came to symbolise freedom or revolutionary fervour, it had another signification in the west. It was a symbol associated with the east. Indeed it seems to have been worn by arange of peoples in the Balkans and Asia Minor. Macedonian, Thracian, and Dacian military helmets all had forward pointing tops perhaps mimicking Phrygian caps. The Phrygian cap can be seen on Trajan's Column, worn by the Dacians, and on the Arch of Septimius Severus, worn by the Parthians. Roman poets habitually used the term "Phrygian" to mean Trojan. In Greek art, the Phrygian cap served to identify Paris as a Trojan - and so definitely not a proper Greek. 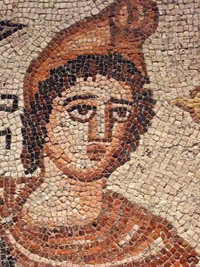 The mosaic on the right shows Orpheus wearing a Phrygian hat. The cap also appears on murals in a 4th century Thracian tomb at Kazanlak in modern Bulgaria. The Phrygian cap was worn by the god Mithras - shown on the right. He was a Saviour god in the Dualist Persian tradition based on the Zoroastrian religion. Mithras was a forerunner of the Saviour-god Jesus Christ who borrowed Mithras's halo, his birthday and his temple on the Vatican Hill in Rome, but not his Phrygian hat. The same headgear also features on the heads of the Three Magi in old depictions of them - marking them as being from the east, like this depiction (above left) from a church in Ravenna. The name Magi denotes Zoroastrian priests from Persia. Curiously, Mr Punch, as in Punch and Judy, always wears a red Phrygian cap - did he originally come from the east? The name Liberty cap also denotes a type of mushroom that looks reminiscent of a Liberty Cap on top of a Liberty Pole.